Preheat over to 350o F. Mix oats, sugar, flour and cinnamon together. Cut up butter into small pieces and add to dry ingredients. Peel and slice apples into thin slices, no more than ¼ inch thick. Place in a 9 inch pie plate or a similar baking dish. 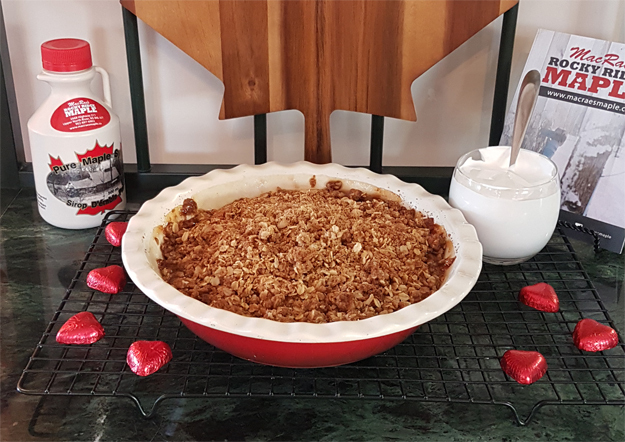 Drizzle maple syrup on top of the apples and then sprinkle the oat mixture on top. Bake at 350o F for 45 minutes. Serve warm topped with Maple Whipped Cream and a drizzle of maple syrup, recipe below. Combine sugar, cream and vanilla and whisk until the mixture forms stiff peaks. Fold in maple syrup. Great on Apple Crisp, Waffles, Pancakes and Ice Cream. 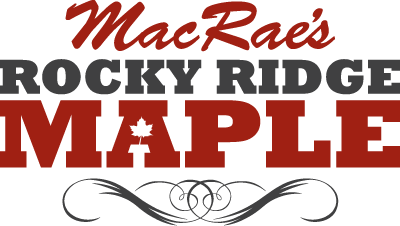 To place an order please call 902-897-6902 or email macraesrockyridge@gmail.com. Due to regulatory requirements we are currently unable to sell outside of Nova Scotia. © 2019 MacRae's Rocky Ridge Maple.